An OpenID is a way of identifying yourself no matter which web site you visit. It’s like a driver’s license for the entire Internet. But, it’s even more than that because you can (if you want) associate information with your OpenID like your name and your e-mail address, and thenyou choose how much web sites get to see about you. This means that web sites that take advantage of OpenID won’t bother you for the same information over and over again. OpenID also simplifies signing in. With OpenID you only have to remember one username and one password. That’s because you log into websites with your OpenID, so your OpenID is the only thing you have to make secure. Now, you might already use one username and one password online, but OpenID lets you do this in a secure way. That’s because you only give your password to your OpenID provider, and then your provider tells the websites you’re visiting that you are who you say you are. No website other than your provider ever sees your password, so you don’t have to worry about an insecure website compromising your identity. 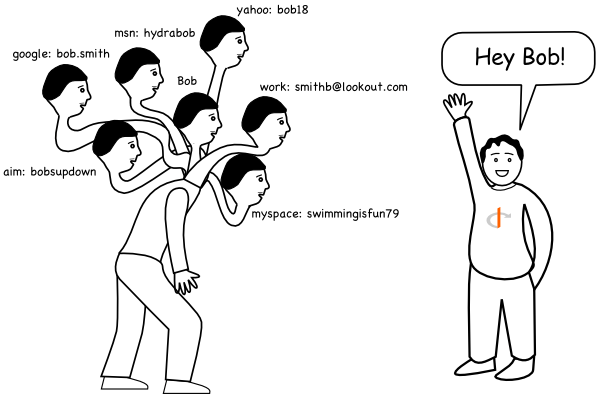 Remembering all those usernames can really weigh you down! Lots of companies are getting behind OpenID.Because OpenID identifies you uniquely across the Internet, it is a way for web sites and other people to connect the different accounts you’ve created online into a more cohesive persona. Once you establish yourself as the person who uses a particular OpenID, whenever someone sees your OpenID in use, anywhere on the Internet, they’ll know that it’s you. Similarly, if you happen upon a new web site and see that someone with your friend’s OpenID has made a comment, you can be almost certain that it was actually her and not somebody who, by coincidence, has the same name. That said, you might be worried that OpenID is going to make all of your activities online transparent. Your OpenID does unify information about you, but it only unifies information that you’ve already made public. And, you get to choose, using OpenID, which information to spread and to whom. OpenID is no less (or more) secure than what you use right now. It’s true that if someone gets your OpenID’s username and password, they can usurp your online identity. But, that’s already possible. Most websites offer a service to e-mail you your password (or a new password) if you’ve forgotten it, which means that if someone breaks into your e-mail account, they can do just as much as they can if they get your OpenID’s username and password. They can test websites with which they think you have an account and ask for a forgotten password. Similarly, if someone gains access to your OpenID, they can scour the Internet for places they think you have accounts and log in as you… but nothing else. Regardless of whether you use OpenID or not, you should be careful about your username and password.When you type your username and password, make sure you’re actually on the website you think you are (i.e., check the address). Aren’t I entrusting my whole identity to one website? Yes and no. You can, if you like, have multiple OpenIDs, each of which has some information about you. (In fact, many websites let you associate multiple OpenIDs with the same account.) But, that ruins the simplicity of only having one username and password. That’s why it’s smart to get your OpenID from a website you trust, and one that you expect to stick around. See How do I get an OpenID? 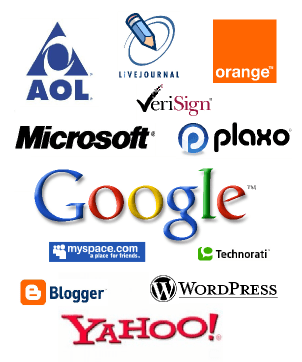 for more information on choosing a good OpenID provider. You use OpenID to log into websites without making completely new accounts. It doesn’t keep track of what you do on those websites; that is still controlled by the websites. As you get used to it, it gets easier and easier. You only entrust your password to one website, as opposed to all websites. All of the tips you’ve learned for staying secure online still apply. Make sure to choose an OpenID Provider you trust! It can help connect your online identity. People can be sure who you are across multiple sites. You can choose when you use it and how you use it. There are over 27,000 OpenID enabled sites, and the number is growing. OpenID is not an elephant. In addition, there are several dedicated OpenID providers that are generally recommended by various members of the community. While not a comprehensive list, each of these providers offers a free and secure OpenID to use across the web. Chi.mp allows you to create your own social hub on an OpenID domain you own and control. ClaimID is an easy way to manage your online identity with OpenID. myID.net is an OpenID provider with support for groups and the Korean language. myOpenID is the first standalone provider for both individuals and businesses, with secure multi-factor authentication. VeriSign’s Personal Identity Provider is an OpenID provider with support for multi-factor authentication. lets you build a social identity to use on the web. Previous: Previous post: Indian TV Channels , TV shows and videos – Official Online links!! !